Light winds greeted the PRIMI Naish downwind addicts as Wednesday night continues to tease the event. The week prior to race day (Thu-Tues) provided six days straight of epic downwinds in the 30knot + range…..and tonight we barely had 10knots! 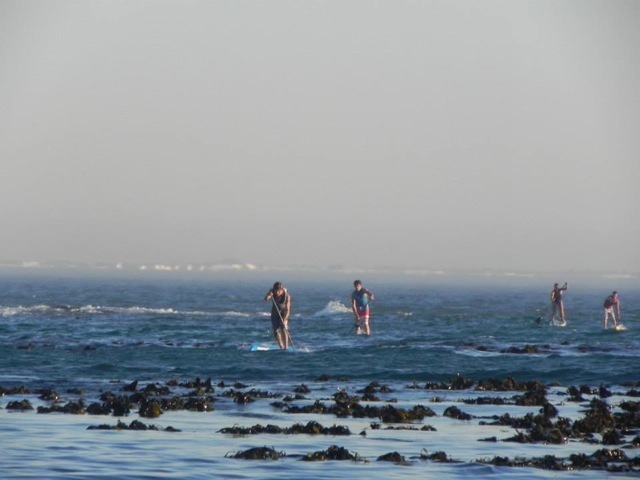 At least the direction was still a perfect S-SE but light wind downwinders are rare in Cape Town and it was good to see 30+ paddlers take part. Paddling in these conditions is about milking every little push you can find and straight off thestart, Brigette van Aswegen showed her intentions. Brigette is training for the ISA Worlds in Nicaragua and her form is clearly improving rapidly as she took off, leaving ladies and gents alike, in her wake. Mishka Steyn caught up and stuck with Brigette but Brigette held it to the line and took a well deserved win in 1.08.12 with Mishka a mere 13 secs behind. Monika Wolgemuth took a fine 3rd in 1.15.03 while Maleen Hoekstra decided the boat was a better option as the last week of paddling was taking it’s toll. In the Mens Open it was the “Lighties” who dominated the field – light as in young and light as in still not showing signs of too much pie-feasting. Dylan Frick is the ace in these conditions and it was he who took the lead, but Ethan Koopmans wasn’t going to let him have it that easily as Ethan stuck with Dylan the entire way. 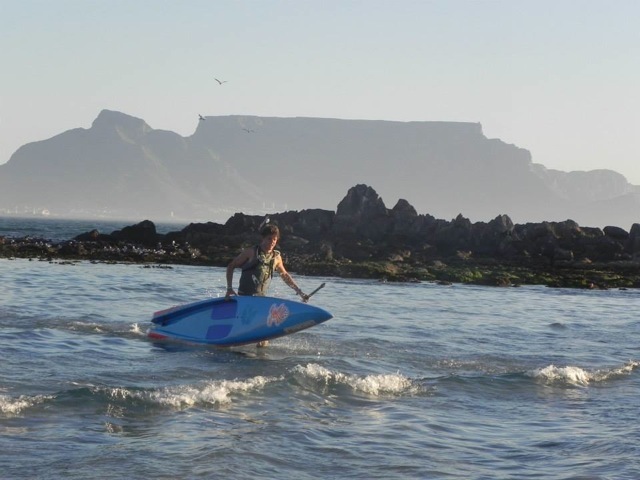 Dylan chose his flatwater Sprint while Ethan stuck with his LE board. 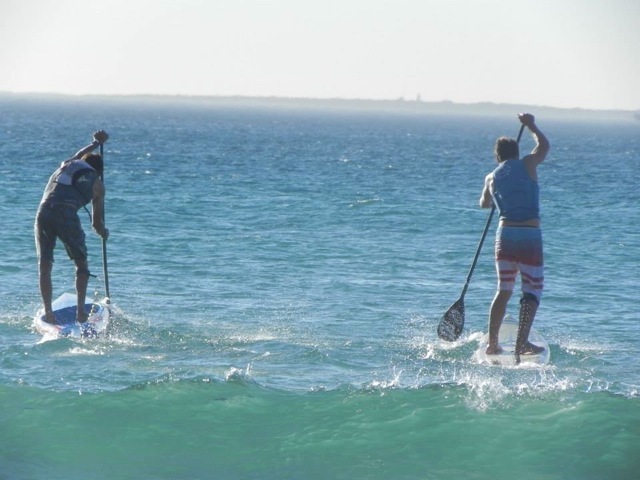 Both these boys are also in training for ISA Worlds and their form is clearly getting there. Joshua Robertson couldn’t quite hang onto these two youngsters, but his speed was remarkable as he has barely been training, and he held third the entire way. Dylan took the win in 55.32, with Ethan coming in 56.14 and Joshua in 58.48. In the Masters it was I who took first in 1.00.10 with Armien Wohlgemuth in 1.03.46 and Craig Ginsberg baptizing his LE with a 3rd in 1.05.22 – the elders statesmens excuses ranged from a heavy week of overtraining to just being old……the wind really didn’t offer much assistance and all paddlers had to dig deep! In the Juniors Ethan remains unbeaten with Joshua taking 2nd and Kimon dos Santos taking 3rd in 1.00.12. With 3 races remaining Dylan Frick now has a commanding lead in the series with Ethan sitting pretty in 2nd – whilst Brigette and Mishka are head to head. We look forward to the regular winds hitting on a Wednesday so that the PRIMI Naish Series can be concluded in style in the next 3 week!